Hotel block closed – rooms may be available at rack rate. Select a hotel number on the map to display a page of information about the hotel. Note: Not only is there a free shuttle running down 16th St., but the green line on the map above indicates the light rail line (running between 16th St. and the Convention Center, among other places). We are in Denver at a very exciting time. It has become a much sought-after meeting destination, and we're only the third largest convention in the city on our weekend. We will be sharing convention and hotel space with John Deere reps and the American Statistical Association (a group that will surely want to peek into our programming). Part of the fallout of Denver becoming so popular is that to get anything like the rates fans are used to, we're blocked into several hotels. This is good news for those folks who want to use their points for a particular chain. It means we aren't at one or two hotels, but all of our properties are located within walking distance, and have public transportation readily at hand as well. The hotel table includes rates and comments, and we've included a map of the downtown Denver area to put the layout in perspective. However, we also want to give you more information on our hotels. The Hyatt Regency Denver at the Colorado Convention Center (1 on the map) is the hotel directly across from the CCC. It is the newest hotel in our block, and is the best designed for handicapped access. Let us know if you need an accessible room. There will be a small amount of programming in this hotel. The Crowne Plaza (2 on the map) is formerly a Holiday Inn and has been extensively renovated. It is between the Colorado Convention Center and the Sheraton. For this reason Childcare will be located here as the most convenient for parents going to activities in both places. The Courtyard Denver Downtown (3 on the map) is directly on the 16th St. Mall, in the heart of the restaurant area, and is just over 2 blocks away from the CCC. It has all the features that make Courtyards so popular with fans. The Westin Tabor Center (4 on the map) is a AAA 4-Diamond property, and while we have blocks in some lovely places, this is one of the swankiest, and one with really spacious rooms for a downtown hotel. One of its features is a mile high heated rooftop pool. It is adjacent to the 16th St. Mall and close to the CCC. 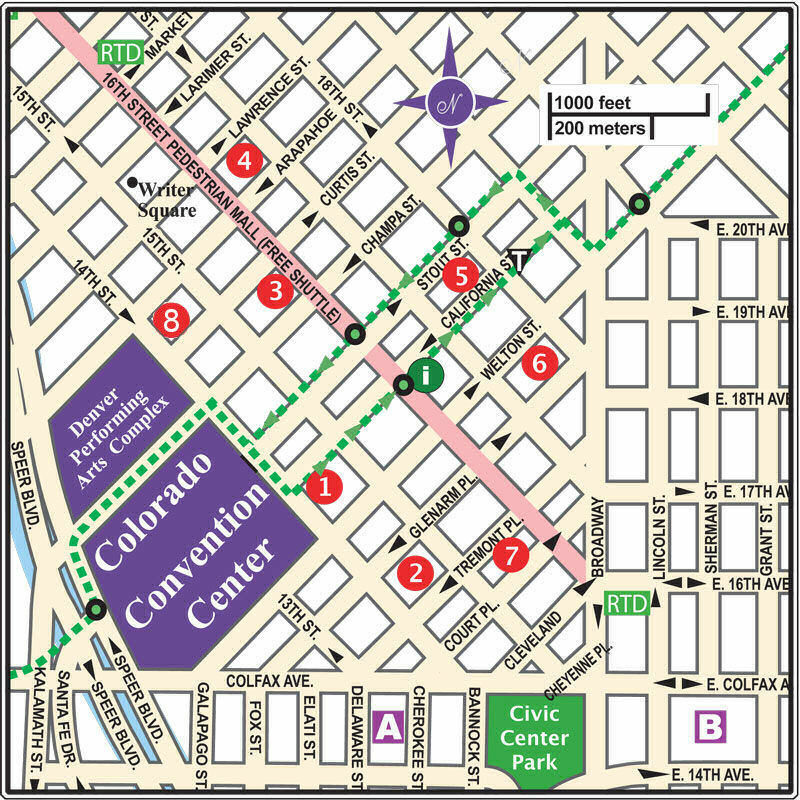 The Denver Marriott City Center (5 on the map) is a luxury Marriott directly on the light rail to the CCC, but is also within easy walking distance (3 1/2 blocks). Besides the beloved by fans Marriott points, it offers a convenient location a block from the 16th St. Mall. The Grand Hyatt Denver (6 on the map) is another award-winning AAA 4-Diamond hotel located within easy walking distance (roughly 3 1/2 blocks) of the CCC, near the Sheraton, and a block from the light rail that runs directly to the entrance of the CCC. Recently updated, and award winning, it is a gorgeous property with spacious rooms. The Sheraton (former Adam's Mark) (7 on the map) We hope they keep the horse statues though. They make the lobby distinctive. In this hotel will be later evening programming, including dances and filking. All parties will be in the Sheraton. It is 3 1/2 blocks from the CCC, and on the 16th St. Mall. This hotel is the only hotel where you can hold an open party. The hotel is now non-smoking. If you need a smoking room and booked at the Sheraton, you may wish to change your booking to one of the hotels that has smoking rooms, such as the Grand Hyatt Denver. The Curtis (8 on the map) is a new hotel with theme floors (including the Sci Fi floor!) and a very brightly colored Web site. Not your average chain hotel, which means it is not part of any rewards program. However, it is only 2 blocks from the CCC and the 16th St. Mall. We are not able to change a rate for the Hyatt Regency at the Colorado Convention Center if you have booked a partial stay at the D3 rate and take the other nights at a higher rate. Your options are to pay the higher rate for those night(s) or to book at another of the blocked hotels. If you have handicapped accessibility issues, please alert us to them at d3-housing@denvention.org as we are trying to give Hyatt Regency at Colorado Convention Center preference to those people. If you booked at the Crowne Plaza or the Marriott Courtyard on the phone, be absolutely sure you booked at the convention rate. Apparently, some people who called these hotels booked at rack rate (which is much higher than the con rate) were told that Denvention could "fix" the rates later. It is not possible to change a public rate to a convention rate after it's been booked. Since both of these hotels are sold out, you will not be able to rebook at those hotels at the convention rate. However, don't forget that other hotels still have rooms at the convention rate. Rooms can be reserved at the convention rates for nights between Monday, August 4 and Monday, August 11 inclusive. If you would like to arrive before or leave after these dates, or if your preferred hotel has already sold out on some of the nights during that time, make a reservation for the dates that you can and then E-mail housing@denvention.org to request an extension. We will see if the hotel is willing to give us additional nights, but we cannot guarantee that we will be able to extend any reservations beyond these dates, or that the hotel will give us more rooms on any night between August 4 and August 11 that we do sell out. There are a number of quirks when trying to set up booking systems for seven different hotels. There are additional quirks because the Adam's Mark was bought last year and is now a Sheraton. What this means is that the process of booking rooms in each hotel is different from all the others. If you run into a problem booking, and it can not be solved by going back and trying again after rereading the directions, E-mail housing@denvention.org and let us know about it. Several of us are monitoring this list and we can alert the hotels when problems are discovered. The Sheraton will be our party hotel and we have a limited number of rooms in this hotel. There will be no quiet floors there because we have to block all of our rooms around the suites that we have (which, as of mid-June, have sold out). All rooms will be noisy and we need to keep as many of them as possible for the people who will be hosting parties. Many people will have to "time share" the suites, as we anticipate that there will not be enough suites to go around. We will be rotating people out on a nightly basis so the people who will be in a suite one night will need rooms in the Sheraton for the nights when they do not have a suite. Rooms are at a premium. So, under no circumstances should anyone book more rooms than they are planning to occupy. Please don't book in multiple hotels because you haven't decided in which one you will be staying. Our goal is that we get as many of you into the hotels you would most prefer, with as little drama as possible. Therefore, we will be monitoring the room bookings for duplicates and will contact people who have made duplicate bookings in order to verify the need for those duplicate bookings. Add the other person's name to your room -- if you have other names on your room at the time, take them off. You don't want to run the risk of the hotel charging a higher rate for a triple or quad (not all of our properties have flat rates across the board). Change the credit card guaranteeing the reservation to the other person's credit card (s/he will have to call the hotel to do that). The other person then takes your name off the room. Following this procedure ensures that the room won't slip back to the hotel's control, because if it does, it most likely will not go back into our block at the convention rate. If you have difficulties with your hotel reservation or questions about it, please email housing@denvention.org.